By raising the minimum wage, our residents who work an honest day can support a family and feel pride in sustaining themselves. 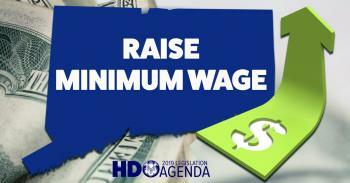 We have proposed HB 5004, An Act Increasing the Minimum Wage, that aims to provide more economic security to Connecticut families. The bill was referred to the Joint Committee on Labor and Public Employees yesterday. The Senate has also proposed an identical bill. The Public Hearing for both bills will be held on Thursday, March 7 from 11:00AM in Room 1D of the Legislative Office Building. You can email LABtestimony@cga.ct.gov to submit written testimony. To testify in-person, sign up will begin at 9:00AM in Suite 3800 of the Legislative Office Building. Let's work together to make this happen!